I mentioned last week that we held a Family Olympics when my relatives were in California for my niece's baptism. My sister Kari and brother-in-law Brian organized the whole thing. We were given no information ahead of time except that we were each to pick a country to represent. Steve chose England, Trevor chose Mexico, and I chose St. Vincent and the Grenadines. It would take a whole blog post to explain the connection I've had with the small Caribbean nation of St. Vincent & the Grenadines for the past 24 years; one of these days, I'll tell you about it. When we arrived at my parents' house, this board was on display. Each of the 14 contestants and their countries were listed, starting with the oldest competitor (my mom, Kathy) and ending with the youngest (Trevor). Kari and Brian didn't compete, nor did the kids that were under 5. We began with a parade of nations. As each competitor was announced, their national anthem played. Here is my cousin Matthew (Scotland), his wife Danelle (Italy), and their kids Ryan (Ireland) and Lillian (Spain). Here I am at the Opening Ceremonies, wearing a St. V & G t-shirt and waving a pillowcase of their flag that my friend Colleen made for me back in 1990. Our first event was the Ring Toss. Steve tied with Ryan for the gold medal. I did ok - middle of the pack. Things went significantly downhill for me during the second event, Darts. My left shoulder and arm had been quite sore for the past few weeks, largely due to pitching to Trevor for a good amount of time each day. When I raised my arm to throw my first dart, my arm completely gave out and fell to my side. I couldn't lift it without excruciating pain. I announced that I'd be forfeiting the event and all future physical events. My family convinced me to try throwing the darts with my right hand instead. I was honestly afraid that I was going to send a dart into a loved one's head by using my non-dominant hand, but it turns out I'm actually pretty good with my right hand. I scored just above the average. My nephew Timothy, representing Uruguay, was the gold medalist. Here's Trevor during his turn. Alas, my glory was short-lived. The 4th event was Trivia. I'm normally decent at trivia contests, but I scored a measly 3 points out of 10. Ginger medaled for the second time. Our fifth event, the final event of Day 1, was the Airplane Toss. We had 5 minutes to construct the best paper airplane we could from only our trivia and word search papers. I did very poorly, which I blame largely on throwing with my right hand. As it turns out, I can throw darts right-handed, but I cannot throw much else right-handed. Here's my Aunt Vickie, dressed in the colors of Kenya's flag (green, red and black). Before each event, she gave a presentation about a different aspect of Kenya - the geography, the political structure, the population, the educational system, etc. Once a teacher, always a teacher! I loved learning more about Kenya and looked forward to her turn during each event. Vickie's husband, my Uncle Don, was the gold medalist, having thrown his plane an impressive 101 feet! We sat down to a friendly dinner to discuss the day's competitions and to hear the results from Day 1. Don was in the lead. (I was in 5th place.) We were all very curious as to what the next day's events would be. The next morning, it was time to resume the Olympics. The first event: a Rock-Paper-Scissors tournament! I made it to the second round before I was eliminated. Ginger won her third gold medal. Event #7 was Children's Nursery Rhymes and Songs trivia. Right up my alley! I got a perfect score and earned my second gold medal. Next was Event #8: Sudoku. I've done Sudoku before (only in in-flight magazines), so this gave me an advantage over the two family members who'd never done one, but I knew going in that I could not compete with the likes of my dad, aunt and cousin, who all do Sudoku daily. We had 10 minutes to try to fill in as many numbers as we could, with a 1-minute warning so that we could make random guesses and hope to score more points. I got 26 right. My cousin Tim finished the whole thing perfectly in 2 minutes. I couldn't believe it. Aunt Vickie, my dad, and Ginger finished a few minutes after that. Impressive. The 9th event was Name that Tune. With the contestants ranging from age 65 to 7, we had a wide variety of musical knowledge. Apparently being the oldest of my generation (41) put me in a good spot, since I recognized a few more songs from the 60's and 70's than my slightly-younger cohorts did. In general, my parents' generation struggled with everything after the 60's and Trevor's generation didn't recognize much that isn't on the radio right now, so I ended up with my third gold medal. Our final event was Ping Pong Toss. We each threw 10 ping pong balls into a vase. My cousin Matthew and nephew Timothy tied for the gold with 3 successful tosses. Kari and Brian left to total the scores. When they returned, it was time for the medal ceremony. Ginger (representing United Arab Emirates) took the gold! The silver and bronze went to my cousins Tim (Brazil) and Matt (Scotland). I came in fourth. 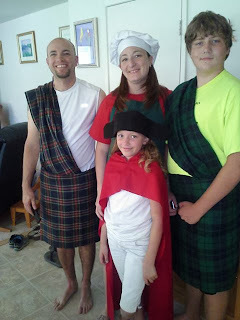 We all had a blast with our first Family Olympics and agreed that it should be an annual event. Tim and Ginger offered to organize the next one, to take place when we all get together in the summer of 2014. Regarding my shoulder: I went to the doctor as soon as we got home. I was diagnosed with a grade 2 shoulder strain and told not to use it for three weeks. It's amazing how often one uses their shoulder - something you don't really notice until you can't use it! This is crazy! I had no idea there were sites like that! That's NUTS!! I hope that you are eventually able to get that taken down. I'm going to have to make sure I don't have a blog this button showing on my blog either!! Yikes!! TFS!! Gosh. Your family sure does a LOT of fun activities together. This must be super fun to plan and execute! Congrats on your 4th place finish! But I have a question... How are you typing?! This post must've taken FOREVER with one hand. Now THAT'S dedication! !